REVELLERS headed West to bank some of the summer’s final rays on Saturday. West End and the village’s annual show was the destination for hundreds of frolickers as the season begins to shift into autumn. The usual plethora of quintessentially British games, events and attractions tickled the fancy for many, with prizes on offer for those who excelled in their chosen field. Among the stallholders were the Brookwood Art Group, who were selling cards made from their members’ pictures to raise money for Ehlers-Danlos Support UK. The Lions Club also made an appearance as the annual event made a roaring return, giving youngsters a chance to ‘spin and win’ a football. Canine companions were not forgotten either, and they took centre stage as the highly contested Dog Show pitted pets against each other for ribbons. 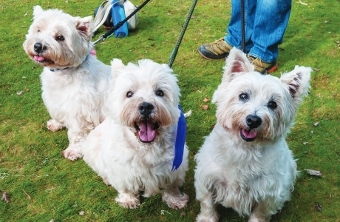 Winner of the Best in Show prize was Boba, owned by Freddie and Henry Walden. But despite the dogs having the run of the place out in the main arena, they were still not the biggest animal draw on the day. 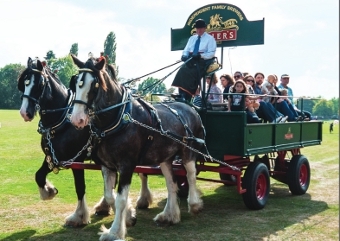 Ferrying guests around the show were a couple of Fullers Heavy Horses, who earned rave reviews from all who hitched a ride over the weekend. 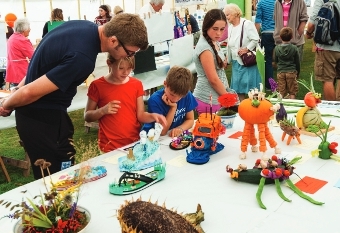 Creative displays of consumables were also on the menu during the celebrations, and a creative combination of edible ‘monsters’ made for quite a sight during the day’s Plant Show.